Screensharing is a useful feature that allows you and your participants to share application windows or your/their desktop. 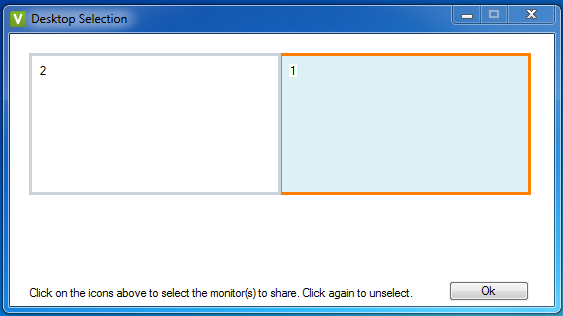 This article illustrates how to share a screen on a Windows computer. While mobile devices can view shared screens, they cannot share their own screens. NOTE: Screensharing is limited to visual elements only. While you can play videos in a shared screen, the audio of that video may not be shared, depending on your mic. You may want to schedule a technical support session to test this before trying it with any clients. 2. You can share either a single application window, or your desktop(s). To share your whole desktop, use the "Share Desktop" button at the bottom of your Dashboard (or if you are the participant, the bottom of the waiting room page). Note: once you click this button, the entire desktop will be shared immediately. Resize what is shared by hovering your mouse over the edges of the share window until it becomes a double-headed arrow, and then adjust the size as desired. Text: Click on this tab to create a text box that you can write in. Erase: Click on this tab to immediately erase all of your markings. Disable Control: Between Windows computers, you have the option of taking remote control of a shared application (e.g., moving your cursor, typing things into the document, etc.). But as the sharer, you also have the ability to block your participants from doing this. Just click on this tab. Unshare: Click on this tab to stop sharing the application window. This article was last reviewed by our Support team on August 23, 2016.